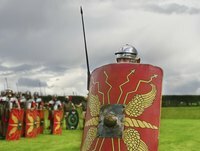 The pilum, or Roman spear, was a weapon of the ancient Roman soldier. It is a long pole-like weapon that the soldiers would hurl at their charging enemies. Its small arrow point would penetrate the shields and armor, but was designed to bend on impact so it could not be hurled back to the original sender. When making a Roman spear as an accessory for a Roman soldier costume, it can be sized to proportionally fit child or adult. Choose your wooden spear handle according to the person who will be using it with the costume. For an adult, you might use a wooden broom handle. For a child, use a wooden dowel. The length should reach from the floor to at least shoulder height. Draw an arrow shape on one piece of the cardboard that will fit on the end of the spear. It should fit proportionally to the wooden handle. Cut out the spear-tip shape and trace onto the second piece of cardboard. Cut out the second shape. Place each piece of the cardboard cut out on the end of the spear. Line up the shapes to match, with the tip of the pole's end between the pieces. Wrap masking tape around the spear tip, securing it to the end of the pole. Cover the spear tip with foil after the tip is secured to the end of the pole. The foil covering is intended to make the arrow look like metal. Use hot glue to secure the foil. Wrap black electrical tape around a 1-foot section of the pole at the opposite end from the spear tip. The tape is intended to mimic leather that was sometimes wrapped around the end of the spear to improve the Roman soldier's grip. Paint the entire spear handle silver for a more metallic look. 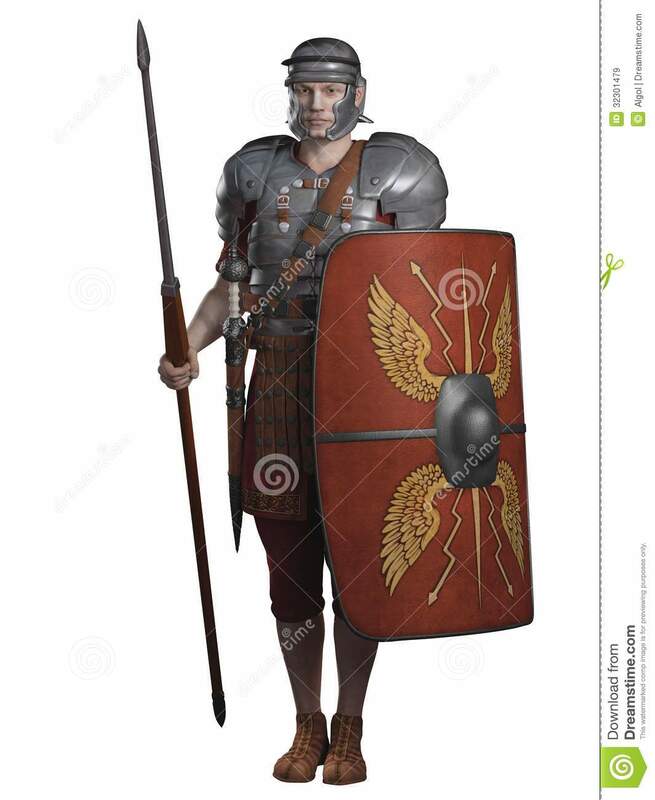 Create a Roman shield from cardboard and paint to accompany your spear.